When the mist hangs over Swakopmund like a heavy theatrical curtain and you feel the urge to drive out into the sunshine for fabulous desert fare, head out on the B2 for approximately ten kilometres and make a turn towards the Swakop River smallholdings. An enjoyable Saturday outing awaits, one that you’ll soon include into your Swakop visits once you’ve made your first foray into the intriguing area. This is where the green vein of the ephemeral Swakop River winds its way through the desert, creating a lifeline in the arid landscape. It is a fertile pocket where salad greens are grown, and small home industries and weekly markets have emerged. Your first stop is Shalom Farm, where a grove of palm trees provides shade and a relaxed setting for breakfast, brunch, lunch or a cup of coffee and cake. Bronwin Ockhuys and Stefan-Anthony Jooste have teamed up to provide tasty nourishment and an assortment of fresh vegetables, continuing a successful Saturday morning tradition that has become popular over the years. Bronwin runs the creative café, keeping locals content with German favourites such as Rohhack (raw mince), Rauchfleisch (smoked meat) and Fleischsalat (meat salad) on brötchen, while introducing new and extraordinary delights including freshly-squeezed vegetable juices, gigantic pretzels, chocolate red-wine cake and red-velvet cupcakes (cupcakes with a beetroot base and cream-cheese icing). It’s ‘a little out of the box’, she admits happily, adding how her food has proved so popular that customers have begun to request takeaways to enjoy at home afterwards. The groups of people sitting at tables adorned with sunflowers or olive-tree sprigs usually do their shopping before sitting down to enjoy chatter and café cuisine. 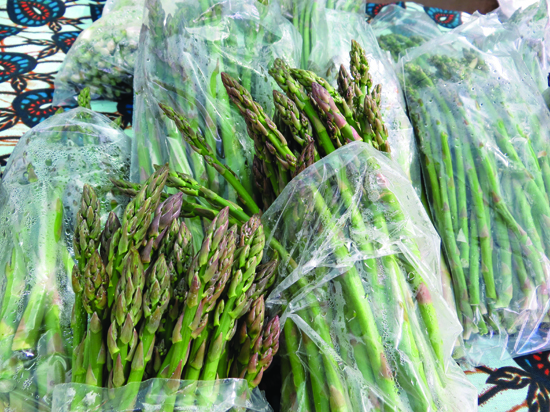 Market tables are filled with an appetising selection of vegetables, including fresh asparagus, which thrives on the salty river water, bottles of olives and olive oil, homemade herb mayonnaises, mustards and breads (made by Bronwin), pickled cucumbers and tomato chutneys (made by Stefan) and smoked meat, sausages, cabanossi and other meat products from the Sophia Dale farm down the road. The responsibility of growing and harvesting the vegetables rests in Stefan’s capable hands. His horticulture degree has provided him with the know-how and his green fingers do the rest. 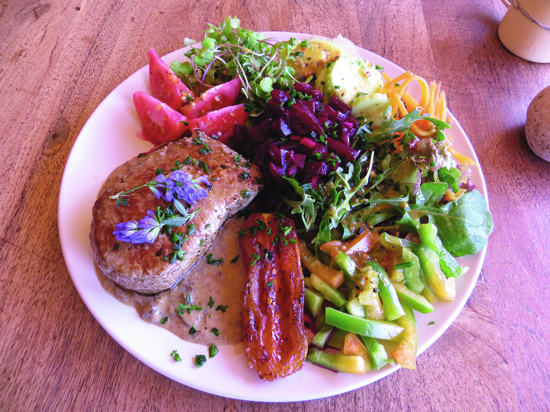 The duo is working towards making the market and café as environmentally friendly as possible with a range of vegetables that Stephan calls ‘worm-friendly’ and a selection of free-range meat products. It’s a peaceful scene with children playing on the jungle gyms and swings while the adults indulge in the joys of life. Further down the Swakop River road (4.8 km, to be exact), just when you become slightly concerned that you’re driving off into desert emptiness, a sign marks the turnoff to Desert Hills, another small oasis in the desert. Husband and wife, Volker and Stefanie Hümmer, began pressing the seeds from !nara melons in 2008, producing a rich, nutty oil. !Nara is a hardy – and prickly – desert plant that is harvested by the Topnaar people who live in the Kuiseb River Valley. The team recognised the value of using the nutritious oil, high in fatty acids, for their products. While Volker, a chef by profession, used the !nara oil to create flavoured oils and salad dressings, Stefanie began to produce !nara cosmetics. 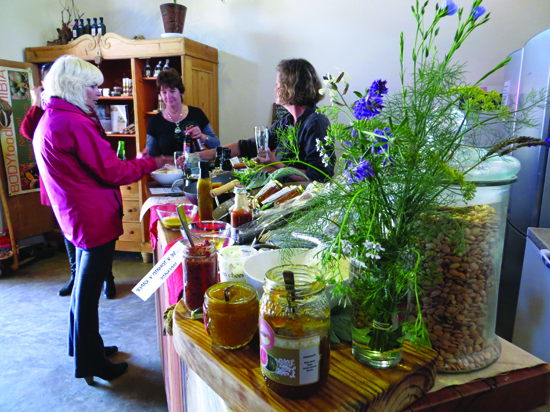 They open their bistro and deli/farmstall to the public on Saturdays. Volker says that it is more correct to call it by its German term, Hofladen, which indicates that the shop sells produce made or grown on the premises. The deli has a grand selection of interesting and tantalising goods – most made with !nara oil, freshly picked vegetables grown in Stefanie’s garden or along the Swakop River, and her !nara ‘body food’ range. Lunch is self-service and varies from week to week. It includes a choice of bakes cooked in the wood-fired oven, warm meals (usually game with an exciting sauce), cold platters, colourful salads, rounded farm-bread slices with tasty toppings, dessert and homemade ice cream. 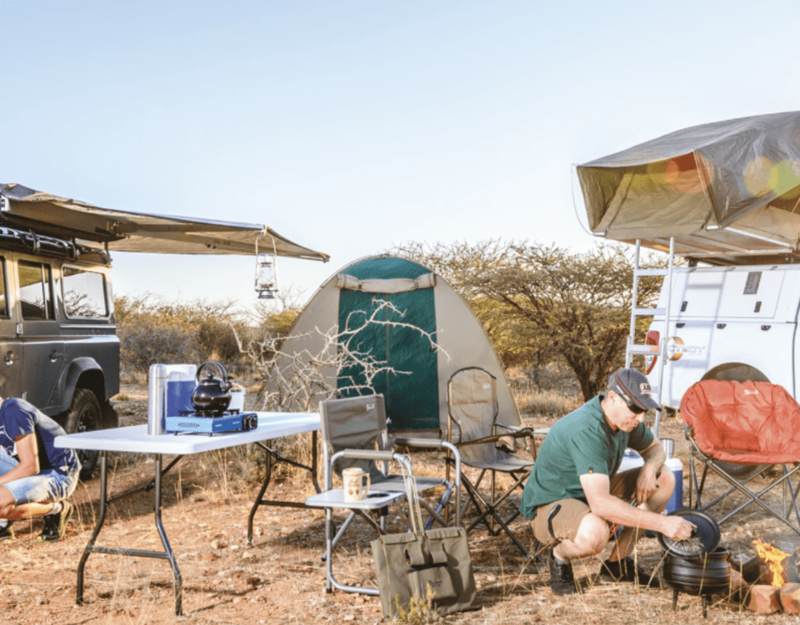 It’s the unusual desert touch that makes the Swakop River Saturdays so appealing: the fascinating fare found so serendipitously in the desert, from asparagus and olives to !nara oil, and the drive into the otherworldly environment. Saturdays are transformed into adventures and taste sensations in the small desert destinations where you can happily eat, shop and while away blissful holiday hours.